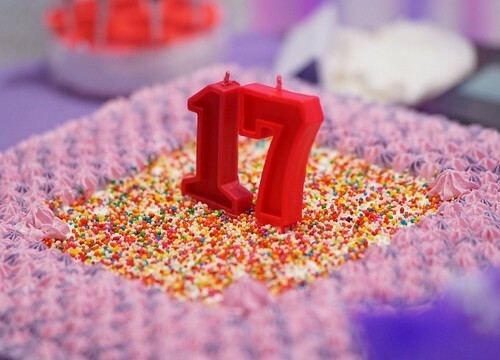 One of the most important and most special milestone in a person’s life, especially a teenager is turning seventeen. It is being one year away to being eighteen, the age of being finally an adult. You can help a girl or even a boy have an extra special day in order to have lots of fun. 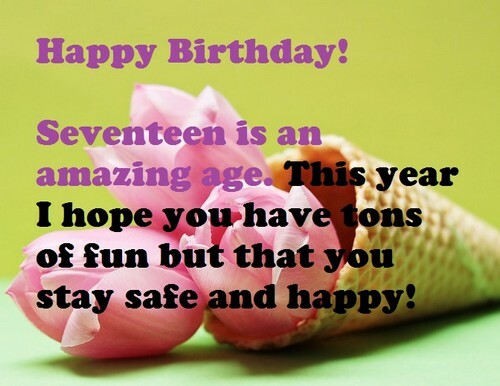 Here are some of the best messages you can use for that person to greet him or her a happy 17th birthday. 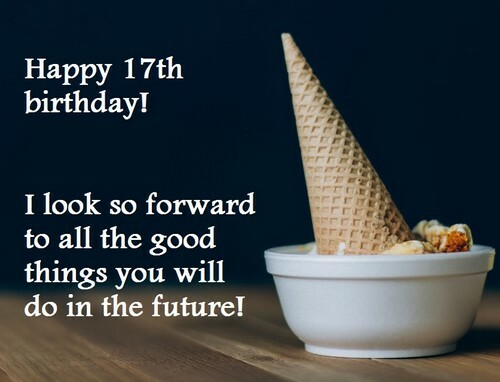 Here are some of happy 17th birthday wishes that you might want to try out or you may want to use to greet your brother, sister, loved one, son or daughter. I hope you have a happy 17th birthday and that you will have so many more years to come! Remember that the Lord will never give you any challenge that you can’t overcome, my dear. Daughter, enjoy your big day for this time only comes once in this year, remember that now. I am just so happy that we get to be friends and that you are truly amazing, my dearest love. You are turning into a fine young man and I wish nothing but a really happy 17th birthday. These times are truly amazing, and I wish that you would keep on being amazing as you are. It seems only yesterday that the first day of class started and now here we finally are, at 17. You have a steady progress from childhood and now to adulthood, we are so proud of you. We truly had great times, you and I on our high school days and I cannot help but be happy. Happy 17th birthday, you are practically the most wonderful woman I have ever known, girl. Happy bday to you, now that you are turning 17, you have a lot of new responsibilities true. May you always remember all the good times we once had for no one can steal that from us. Never ever forget who you are for that is the one I have learned to love, happiest bday to you! You are the most wonderful friend that I have and I only wish you enjoy this bday of yours. For being my best friend in the whole wide world I wish nothing but a happy 17th birthday! You are a good friend of mine and that makes me wish you to have a spectacular day today. There is nothing I would love for you to have but the best in whatever you would want now. You grew older for another year and soon your age is going to turn legal, one way or two. You deserve a happy 17th birthday, so I wish that you would keep on being the person you are. You are the type of person that makes people want to talk about their lives, that is the truth. The funniest friend I have in my life is you and I wish you would be as happy as you can, dear. In this world where everyone is going astray, I am lucky to have you, enjoy your 17th bday! I am so proud of the son that you have become & I wish you the happiest birthday for today. 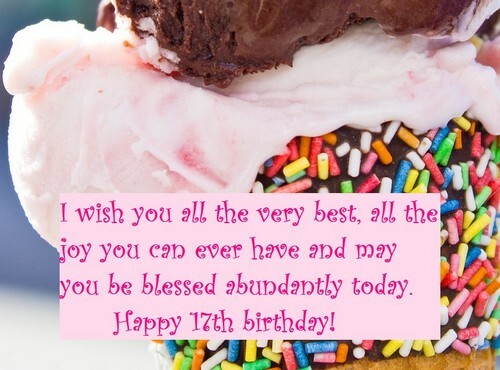 I thank the heavens for your existence, that I am able to wish you a very happy 17th birthday! I just have to tell you how proud I am that you are my son, you are truly wonderful and good. No one is as proud as I am for being your father and I wish you the happiest birthday party! You are my pride and also my best source of joy, I wish nothing for you but everlasting joy. You are just a single year away from being an adult and you just make me super proud, son. Happy 17th birthday you rock as you always seem to I wish you nothing but the best right now. You have truly grown so much and I am just so happy for you to be able to see you now, dear. I have watched you all this time, growing up and I cannot imagine not being with you, sis. Sis, I am so happy for you, that you are almost on the legal age, I wish nothing but the best. I think that you are the best daughter any parent can ever have I hope you enjoy your big day! The truth is I did not know you for all your life but still I hope you have a happy 17th birthday! No one is as happy as me right now, to be able to see you grow into someone I am proud of. You grow up to be more handsome than ever and I cannot believe you are my little child once. I think seventeen is the perfect age to keep having fun and to keep on enjoying your life, right? You are now a young adult, super close to being a full pledged adult and I can’t be happier. For you are the most wonderful gift I have ever received, no one can compare, happy bday! Happy 17th birthday, a lot of people do not understand how amazing you truly are but I do. You make me understand that the best is yet to come and you are that, happy 17th birthday! I watched you grow up and now you are almost close to being an adult, I wish you the best. Standing before me is a young woman I can truly be proud of, may you have a great day, love. My dear, I can only wish you would have the most wonderful time of your life, my dear son. Happy 17th birthday, you are awesome and you are the best person that I know at this room. Stay happy and safe and just have tons of fun, you deserve that, I love you a whole lot, sis. To the best brother in this world, I wish that you would have tons of fun on your biggest day. One year more and you can finally drive and drink so you go ahead and have fun for now. Sometimes, I look at you and find it hard to believe that you are all grown up now, daughter. Let us keep partying all night and just enjoy the day, I really wish you a happy 17th birthday. You are truly an amazing woman we can all be proud of, wishing you all the best right now. Happiest bday to the most wonderful daughter any father can ever have, enjoy turning 17! 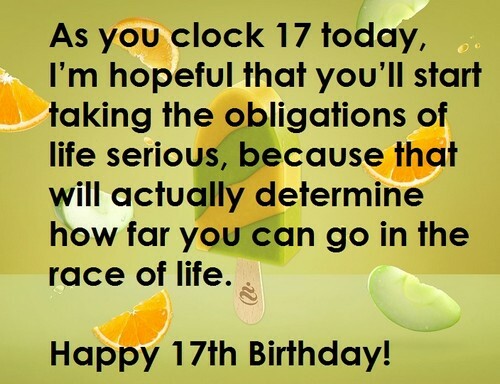 You are now 17, a really good age to be so I suggest you use this year wisely and have fun. Happy 17th birthday, you are the most amazing person to me and I wish nothing but the best. Remember that you will always be here in my heart no matter what, enjoy your 17th birthday. From today on, you are 17 and that means more responsibility but more possibilities to, son. Happiest birthday to the boy who has been a great kid from the very moment you were born. I remember how you begged me for a candy back when you were a kid, now you are 17 now. 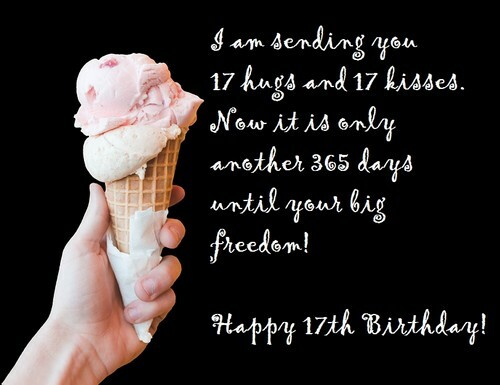 You understand me and that alone is a good reason to wish you a really happy 17th birthday! You have your own car now, you can even drive, I wish you nothing but to have a great day. 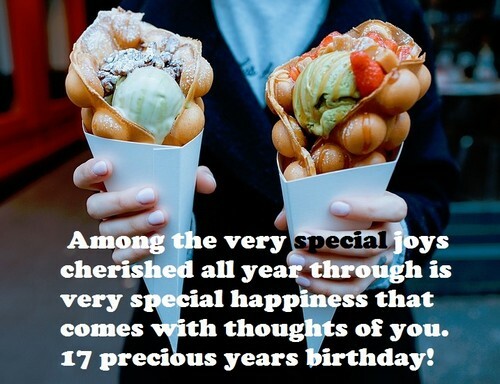 Enjoy your special day and that you may have a wonderful life, I wish you only the best too. Enjoy your 17th bday and just have tons of funs on this day, you truly deserve a great break. Happy 17th birthday, you are the only one that I know who loves the same things that I do. May you never forget that you are an amazing person and I love you so much, my dearest! You were lovelier than the first time we have met and I cannot help loving you more, dear. Who would have thought you are being the best person, but I still wish you a happy birthday. I am just so happy to be able to call you my daughter, I have a really happy birthday now! Happy 17th birthday, may every door that you go to leads you to new things in your life, boy. I am looking forward to the things that you will do in the future with me, happiest bday to you. Some days I cannot believe that you are the child that I once watched growing up, happy 17th! Maybe we did not always get on each other’s right side but we loved each other, enjoy sis! It is so hard to believe you are turning 17, I am so glad we are friends, happy 17th birthday! Bro, I know things have been hard for you as well so I wish you would enjoy your big day. Now I still wish that you would always have a lot of fun and still be patient and loving, sis. I am glad and I am proud to be you sister, that we get to share an extra special bond, sis! Happy bday to you, there is nothing I want than to be as happy as you are, I love you a lot! 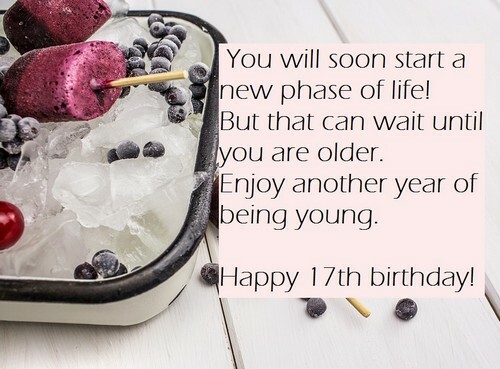 Happy 17th birthday, I can only wish that you will achieve your dreams and all your goals. You may be a snorty type of brother but still I love you all the same, happiest birthday to you. You turned out to be an amazing person I cannot help but love, may you have the best day! I will always be grateful for all the help you have given to me in this life, I wish you great joy. For always being there when I need you the most, I wish nothing but the best for you, dear. May you have new challenges to make your life more interesting, happy 17th birthday, friend. I am just happy you are okay, I wish you would always be as happy as you are right now! Happy 17th birthday, just always know that I will be right here for you always and forever.